Scooter Vacations has fulltime access and delivers to all Disney World hotels. For our Concierge service, we schedule your approximate arrival time to the resort and have your scooter loaded on a delivery van in the area awaiting your arrival for personalized delivery. At the time of delivery we make sure your scooter is to your satisfaction which includes seat adjustment, armrests, steering column and ensuring you know how to charge your scooter each night. If you plan on transporting your scooter, the driver can even go through the steps for assembly and dis-assembly. For those hotels with policies that limit the delivery of a mobility scooter without a fee-based payment agreement* we automatically provide our Concierge delivery service. Disney World On-property Hotels that provide enjoyment of their services and facilities for guests mobility scooter delivery are: Disney Dolphin, Disney Swan, Downtown Disney Hilton and Shades of Green. At these resorts you may select our Standard or Concierge delivery service. All other Disney On-property hotels have policies that limit the delivery of a mobility scooter without a fee-based agreement* so we automatically provide our Concierge delivery service. 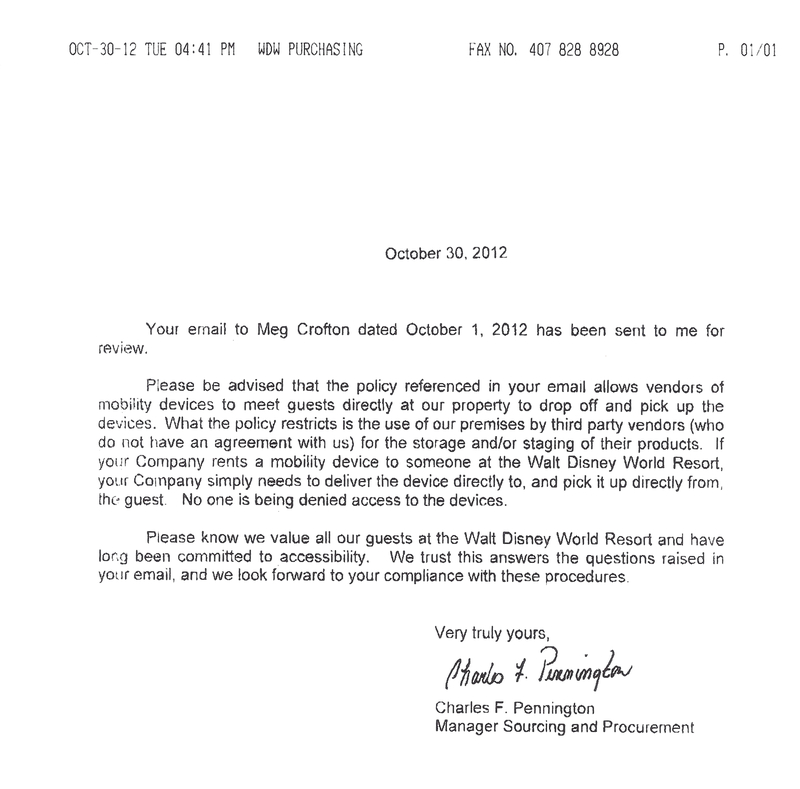 *Click here to view confirmation of delivery access from Disney Sourcing and Procurement which defines delivery of a mobility scooter that a guest rents for use during their stay (even if they have reservations for that day and/or are currently checked in) as “storage and/or staging” and therefore do not allow guests to utilize the luggage room or concierge services for the delivery of their mobility scooters unless the company has an agreement in place to pay them. It does not pose a problem for Scooter Vacations as our driver must go there whether providing our Standard or Concierge delivery service however it is contrary to the ability for a guest to have delivered their non-medical items such as luggage, packages and items delivered via other sources such as UPS, FEDEX or US Postal Service.